The Business and Education Partnership of Waterloo Region is committed to protecting the privacy of the personal information of its employees, members, and other stakeholders. We value the trust of those we deal with, and the public, and recognize that maintaining this trust requires that we be transparent and accountable in how we treat the information that you choose to share with us. During the course of our various programs and initiatives, we frequently gather and use personal information. Anyone from whom we collect such information should expect that it will be carefully protected and that any use of or other dealing with this information is subject to consent. Our privacy practices are designed to achieve this. Where an individual uses his or her home contact information as business contact information as, we consider that the contact information provided is business contact information, and is not therefore subject to protection as personal information. 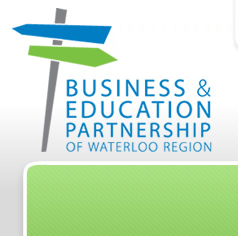 Personal information gathered by the Business and Education Partnership of Waterloo Region is kept in confidence. Business and Education Partnership of Waterloo Region staff is authorized to access personal information based only on their need to deal with the information for the reason(s) for which it was obtained. Safeguards are in place to ensure that the information is not disclosed or shared more widely than is necessary to achieve the purpose for which it was gathered. We also take measures to ensure the integrity of this information is maintained and to prevent it from being lost or destroyed. The Business and Education Partnership of Waterloo Region collects, uses, and discloses personal information only for the purposes that a reasonable person would consider appropriate in light of the circumstances. We routinely offer individuals we deal with the opportunity to opt not to have their information shared for purposes beyond those for which it was explicitly collected. We protect personal and other information we receive on-line. Measures are taken to routinely update our software to maximize protection of such information. We regularly review our privacy practices for our various programs and initiatives, and update our policy. For further information on privacy and your rights in regard to your personal information may be found on the website of the Privacy Commissioner of Canada at www.privcom.gc.ca. To ensure that philanthropy merits the respect and trust of the general public, and that donors and prospective donors can have full confidence in the nonprofit organizations and causes they are asked to support, we declare that all donors have these rights. a. To be informed of the identity of those serving on the organization's governing board, and to expect the board to exercise judgment in its stewardship responsibilities. b. To have access to the organization's most recent financial statements. c. To be assured their gifts will be used for the purposes for which they were given. d. To receive appropriate acknowledgement and recognition. e. To be assured that information about their donation is handled with respect and with confidentiality to the extent provided by the law. f. To expect that all relationships with individuals representing organizations of interest to the donor will be professional in nature. g. To be informed whether those seeking donations are volunteers, employees of the organization or hired solicitors. h. To have the opportunity for their names to be deleted from mailing lists that an organization may intend to share. i. To feel free to ask questions when making a donation and to receive prompt, truthful and forthright answers. The Business and Education Partnership of Waterloo Region is responsible for all personal information under its control and remains responsible when personal information is processed by third parties on their behalf. The staff member responsible for the administration and governance of privacy policies is the Executive Director. All personal information collected, either in a paper or electronic format, must be kept in a secure location. If stored electronically, the information must be password protected. All electronic databases must be password protected. All paper forms must be kept in a locked filing cabinet when not in use. Access to personal information is limited to the staff responsible for administering the information. Compromise security, or legally recognized commercial proprietary concerns. The Business and Education Partnership of Waterloo Region will only use personal information for the purpose for which it was collected, except with the consent of the individual or as required by law. Additional uses of information must again receive express consent from the individual. The Business and Education Partnership of Waterloo Region can only collect personal information with prior express consent and/or implied consent from each individual. The purpose of collecting the information must be made clear and obvious. The Business and Education Partnership of Waterloo Region must inform individuals of the proposed use of the information collected. Registration forms used to collect personal information must include a purpose statement. Registration forms must also provide individuals with the opportunity to opt out of having their information collected for purposes other than the necessary for the successful execution of the program or initiative which they are part of. The Business and Education Partnership of Waterloo Region is also responsible for ensuring that the information is accurate, complete and as up-to-date as is necessary for the proposed use. Personal information shall be retained only as long as necessary for the fulfillment of the purpose for which it was collected. Any paper or electronic record that has not been active for one year shall be disposed of. Electronic records must be deleted from the database and paper records must be shredded. Personal information collected by the Business and Education Partnership of Waterloo Region shall be as accurate, complete, and as up-to-date as possible. An individual has the right to ask that information relating to him or her be corrected, and where this is a disagreement about the correctness of the information, the Business and Education Partnership of Waterloo Region shall attach the individual's statement of disagreement to the personal information. An individual may require that any third party to whom their personal information was disclosed, within the year before the time the correction was requested or a statement of disagreement required, be notified of the correction or statement of disagreement. In order to prevent the unauthorized disclosure, copying, use or modification of personal information held by the Business and Education Partnership of Waterloo Region, access to such information shall be restricted by the use of recognized security mechanisms such as passwords and other reasonable safeguards. An individual has the right to file a complaint concerning compliance with the above practices to the Executive Director.